If you need to introduce materials into a blend for your plastics processing requirements you have choices about how to do this. Firstly, you could work by hand. This might seem like a cheap option on first glance, but take into account how inaccurate this method is and you will see that in the long run it could turn out to be the most expensive option. It is definitely open to human error and expensive additives are invariably added in higher quantities than is necessary. It is also possible that not enough of one element may be added, leading to poor product quality and ultimately customer dissatisfaction. So, although this may be a cheap initial investment, long term you could well end up with an excessive use of high priced additives, high reject rate and overall poor quality. Another alternative is to purchase your material pre mixed. This is an expensive option and does mean that you are putting the blending of your recipe in the control of your supplier. What if you need to change the blend at short notice? Dosing introduces one chosen material element, such as concentrated colour, into the flow of material going into the processing machine. For instance, you can introduce a simple feeding unit to the throat of a processing machine which will meter colour concentrate or liquid colour into the flow of virgin material being delivered from a hopper, situated above the throat of the machine. It should be noted that this system can be used for other additives not just colour. Blending however, controls not just the additive going into the processing machine, but all of the necessary components for the recipe. For example virgin material, regrind and colour which are all precisely blended together in a controlled and repeatable procedure. In more detail, Dosers (which are also sometimes called Feeders) are available in two versions. A Volumetric Doser relies completely on free flowing materials and it does need to be calibrated to achieve any level of accuracy. Generally, although cheaper in terms of initial investment, these Dosers are not considered to be as accurate as their Gravimetric brothers. Gravimetric Dosers usually operate in a “loss in weight” mode so that they can accurately monitor and keep on correcting the desired dosing level. They do this by measuring the weight of the hopper supplying the additive. An additional benefit of this method is that Gravimetric Dosers will cope with materials with a poor flow rate. Blenders are multi component dispensing and mixing machines which are specifically designed to constantly combine the necessary components together prior to plastics processing. As with the aforementioned Dosers, Blenders also come in two types. Volumetric Blenders are typically regarded as adequate if the proportions of regrind and additive you are using are not critical to the appearance or quality of the end product. 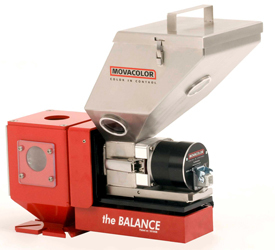 Volumetric blenders rely on the timed dispensing of materials with a free flowing characteristic. If the ability of the material to free flow is in any way compromised this will drastically affect the accuracy. Each component of the final blend must be calibrated because the Blender needs to know volume to weight ratios. Labour is required to adjust the flow rates as necessary and there still remains the possibility of using more virgin or additive than is necessary, which will of course impact on profitability. Gravimetric Blenders, although having the highest initial purchase cost, achieve staggering results and a quick recovery of the initial investment. 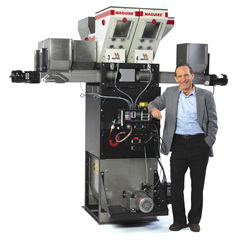 With these machines you can be assured that the proportions of ingredients remain regular. Once set up with the correct recipe most gravimetric blenders will run without intervention, automatically calibrating to ensure accurate proportions and mixing of the elements of the blend. Certain manufacturers have advanced control systems that will allow precise documentation of the blending process for the purposes of quality control. Gravimetric Blenders make no assumptions, each single metered dose of all materials is verified by weight. Any variations in flow, density, time etc are taken into account and hence these machines deliver probably the best automatic blending accuracy. Gravimetric Blenders, dependent upon the specialities of the manufacturer, are available in a wide range of throughput sizes. From micro models for very small processing machines with the ability to blend up to 4 components right through to a throughput capacity of 5500kgs/hr and the ability to blend up to 12 ingredients. Gravimetric Blenders can be utilised in any of four ways. Firstly, by mounting on the processing machine so that all materials entering the machine throat flow through the blender. This is considered to be beneficial as it does not give the blended components any opportunity to separate before being processed. Secondly, the blender may be mounted on a specialised floor stand beside the processing machine. A material take-off box is utilised for conveying the blended material to the machine. This particular option is useful for processors such as blow moulders with vertical, travelling processing screws. Thirdly, a mobile blending station can make a lot of sense in some circumstances. Placed on a wheeled frame this provides maximum flexibility, allowing the blender to be integrated into the processors system. It should be noted that this option is really only suitable for the small to medium size of blenders. Finally, is the opportunity to locate a central Gravimetric Blender or Blenders to serve the requirements of a number of processing machines. This is an option often favoured by plastics processors running the same blend for the purpose of manufacturing multiple products. 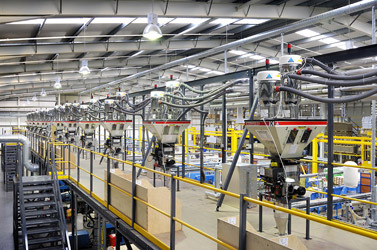 In this instance, the Blender is normally located in a central area, for example a mezzanine and connected to the processing machines by a central conveying system designed for the purpose. Processors will often choose this option as it allows easy material supply, removing pallets and fork lifts from the shop floor and simplifies the material change process. Careful consideration should always be given to the possibility of separation after blending off line as the take off design is key.